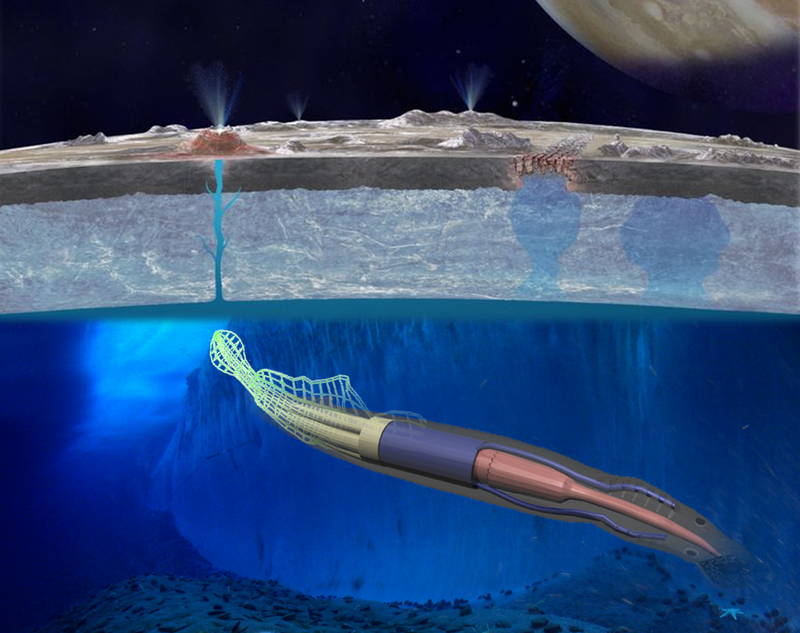 NASA Wants to Build a ‘Robo-Squid’ to Search for Life on Other Planets – I Say Make a Movie! NASA’s latest proposal looks like a sci-fi film in the making. The project calls for the use of a soft-robotic rover that resembles a squid -tentacles included- for missions that can’t be accomplished with conventional power systems. The ‘robosquid’ looks like an eel with a short antenna on its back. The antenna harvests power from locally changing magnetic fields. Ideally, NASA would like to enable amphibious exploration (both land and sea) of gas-giant moons like Europa! The ‘robosquid’ is just one of 15 proposals selected by NASA for study under Phase I of the NASA Innovative Advanced Concepts (NIAC), a program that aims to turn science fiction into science fact through the development of pioneering technologies. NASA hopes the knowledge gained from these proposed studies will bring it closer to its goal of exploration beyond low-Earth orbit, and missions to asteroids and Mars. The projects are chosen through a peer-review process that evaluates their potential, technical approach and benefits that can be realized in a reasonable timeframe. All concepts are very early in the development cycle and represent multiple technology areas, including aircraft propulsion, human life support, science instruments, unique robotic concepts and exploring other diverse technology paths needed to meet NASA’s strategic goals. NIAC Phase I awards are valued at approximately $100,000, providing awardees the funding needed to conduct a nine-month initial definition and analysis study of their concepts.